Michael West’s J-Horror inspired short story “Jiki” will appear in the September issue of City Slab magazine. 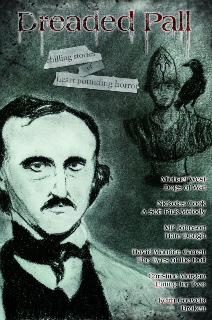 Michael West’s short story “Dogs of War” will appear in the premier issue of Dreaded Pall Chilling Stories of Heart Pounding Horror, due out later this year. Have you ever been to a play and really liked it? Now, have you ever gone to see that exact same play with different actors and a different director? I mean…it’s the same play…word for word, but the actors and director try to put their own stamp on it, try to make their take on the work a memorable one. Such is this new version of The Omen. Up-and-coming political hotshot Richard Thorn (Liev Schreiber) is told that his baby was stillborn. He thinks this news will destroy his wife (Julia Stiles), and so he adopts a child who’s mother died that same night. June 6th (I smell a release date!). As the boy grows, odd things happen. He never gets sick, not even a cold, his nanny kills herself at his birthday party, and a school trip to the zoo results in apes gone wild. Soon, a priest (Pete Postlethwaite) arrives to tell Thorn that little Damien (Seamus Davey-Fitzpatrick) is in fact the Antichrist, the son of Satan himself, and that he must be destroyed before he kills everyone the man cares about. Let’s be honest, the 1976 version penned by David Seltzer had a few holes in it. When Fox gave Dan McDermott the job of scripting this update, he managed to fill some of them in quite nicely. His contributions also include an extended opening that tries to make current world events signs of the Apocalypse, and a few surreal dreams. The rest of the film, however, is word for word from Seltzer’s work, prompting the Writers Guild of America to give him sole writing credit for this movie as well. But it isn’t the writing we remember the original movie for. It’s the music. Jerry Goldsmith won his first and only Oscar for his dark and haunting choral infused score. Marco Beltrami incorporates three of Goldsmith’s cues, but the choir is largely absent. (For those of us who like to hum Ave Satani in the shower [Stop looking at me like that! ], stick around for the closing credits.) The remainder of Beltrami’s themes are original works of surprising power, particularly the driving beat that accompanies Thorn to an Italian graveyard. They are not as memorable as Goldsmith’s work, but they serve this version of the film well. Director John Moore could have taken Seltzer’s script and created a shot for shot duplicate of the original (see Gus Van Sant’s Psycho), but he has wisely chosen to be more visually creative. His colors are deep, particularly the reds and blacks, and he has re-staged scenes in new and interesting ways. Scares come at you from outside the frame, and a scene involving an air bubble in an IV drip is truly disturbing as the camera follows the pocket all the way into the victim’s arm. The actors have also tried to make these characters their own. Schreiber provides his best performance to date. His breakdown, after hearing of the death of his son, gives the opening of this film emotional weight the original lacked. And the casting of Mia Farrow as evil nanny Mrs. Baylock was a stroke of brilliance! Her eyes and smile provide a creepy menace that is echoed in the performance of Seamus Davey-Fitzpatrick as Damien. Particularly creepy is a scene involving Baylock feeding strawberries to Damien prior to sending the boy out to kill. Now we know what kind of mother Rosemary would have been! Did we need this remake? Hell no! But I did enjoy watching this particular company put on a good play. It was well directed and well acted. And, God help me, I even liked the new score! I just watched Saw II for the first time. Okay, spare me the dirty looks. I know I’m behind the times. I mean…we’re just a few months away from Saw III. But trust me, I have a good excuse. I watched the first film on opening night back in 2004 and was disappointed. The story was good, and the twist at the end was very nice, but amazingly horrible acting of Cary Elwes nearly ruined the entire experience for me. So when I learned there was to be a sequel, I was curious, but not excited. Finally, I had heard enough good buzz from people I trusted that I decided to put the flick into my Blockbuster On-line que. The movie opens gruesome enough. A man wakes up and finds he is strapped into a medieval torture helmet filled with sharp spikes. On a television in the corner of the room, we see the puppet face of the “Jigsaw Killer.” Jigsaw (Tobin Bell) tells the man he must unlock the device before a timer goes off or it will snap closed. Problem is…the key is hidden in the man’s eye socket. He is given a scalpel and a mirror and must dig around to find it in time. The scene is frantic, the suspense real and agonizing. For those unfamiliar with the franchise, Jigsaw is a man who is dying of cancer. Being close to death has given him a new appreciation of life. He wants to share this new awareness with others…perhaps turn some lives around. To accomplish this goal, he puts these lost souls into situations, tests that will require them to make choices in order to survive. If they succeed, Jigsaw hopes they will now value their own lives. In Saw ll, the scope of Jigsaw’s crusade has expanded greatly. This time, we are not confined to a single room. No, no, no. This time, our killer has booby-trapped an entire abandoned house and filled it with a group of eight people who, we are told, all have something in common. If this were the movie Cube, the characters would work together and talk things over, make an attempt to discover why they were chosen, then try to understand the rules outlined by Jigsaw on the many notes and audiotapes he has left them throughout this maze of death. But these players are not that smart. They ignore Jigsaw’s taped warnings and clues. And when they learn that one of them (Shawnee Smith) has played the game before and survived, they don’t even bother to grill her for survival tips. Instead, they run from one room to the next, tearing the place apart and falling into Jigsaw’s traps. If the players had stopped to ask questions, they might have learned that one of them (Erik Knudsen) is the estranged son of Detective Eric Matthews (Donnie Wahlberg), the cop that sent them all to prison for one crime or another. Like the characters in the house, Matthews is not interested in playing Jigsaw’s twisted game. With the help of his partner, Detective Kerry (Dina Meyer, another Saw vet), he must find the location of the house before it is too late. “Jigsaw” is an appropriate name for our killer, because this movie is missing some pieces. The opening is strong, and the ending is filled with wonderful twists and turns that surpass the original, but the middle act of the film is its weakest link. Saw writer and co-star Leigh Whannell co-wrote the screenplay with first-time director Darren Lynn Bousman, giving us a group of characters trapped in a labyrinth with little or no back story. The first film was all about discovering why the characters wound up chained in a bathroom. This film is more concerned about getting from one bloody trap to the next. While many of these tortures are ingenious and cringe-worthy, it would have helped to know something about the characters being asked to take part in them. 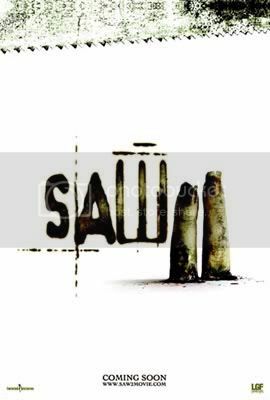 Despite these flaws, I must admit that I enjoyed Saw II. The real joys of the film (for me) were not the various death machines, but the scenes between Wahlberg and Bell. It is obvious the writers were trying for a Clarice Starling/Hannibal Lecter type of chemistry between these characters. The movie falls well short of that, but the actors do a marvelous job of playing opposite ends of the human spectrum. Wahlberg is all passion and emotion. He wants to act. He wants to find his son and save him. And the tension in his face, the tears in his eyes, work to convey his anger and fear. Bell, on the other hand, is nothing but cool intellect. He has the game all mapped out, and there is never a moment when he isn’t playing. From the calm of his carefully chosen words to his gravelly voice and cold stare, he is always in control. “What is the cure for cancer?” Jigsaw asks again and again. Perhaps it is money. No matter how old and sick the killer gets, it is clear Lion’s Gate studios will try to keep the Sawfranchise alive. After this latest round, I must admit, I’m more anxious to see where they take these characters next. All I ask is that they keep Cary Elwes out of it.